After allegations of sexual misconduct against were deemed not credible, Nev Schulman has been able to resume production of his hit MTV show Catfish. Filming of the series had been put on hold while the network investigated the allegations. Ayissha Morgan, a guest on season 4 of the show, made a YouTube video claiming that Schulman had continuously harassed her throughout the production of her episode. In the video, Morgan claims that “Jack” (Schulman) told her that she was only a lesbian because she hadn’t met the right man and that he could be the one to change her mind. She says he made her feel “extremely uncomfortable” and that his behaviour in real life is completely different to how he portrays himself on TV. Morgan ends the video and promises that after 500 likes she’ll post part 2. While this does seem odd, she clarifies in the description that she only asked for the likes so that she could rest assured there were people interested in hearing her story. In part two of the video, she describes drinking beer with a female production assistant in the hotel room and feeling “drugged”. She emphasises that she does not want to accuse anyone of drugging her but she felt she could not control her body and woke up with the woman on top of her. Halfway through the video, Morgan includes a written comment which states “due to the nature of the allegations, it is not appropriate for all audiences”. 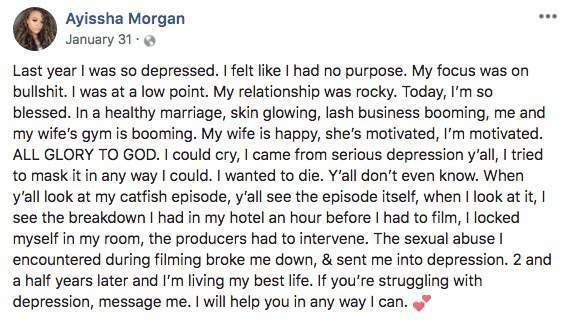 According to this post, the ‘sexual abuse’ she endured on the show sent her into a depression. After the investigations have taken place, MTV has been able to confirm that the show will continue.